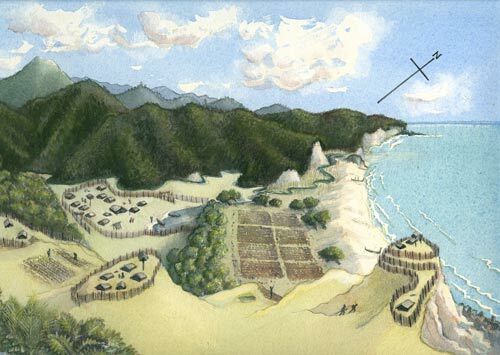 This artwork by Rozel Pharazyn shows an idealised Māori kāinga (settlement). Fixed settlements were often close to major resources – agricultural land for growing kūmara (sweet potato), taro or gourds; rivers and swamps for eels and lamprey; or the sea for fishing and shellfish. Additionally, over time, a location with a defensible hill or clifftop was required for pā (fortified villages).